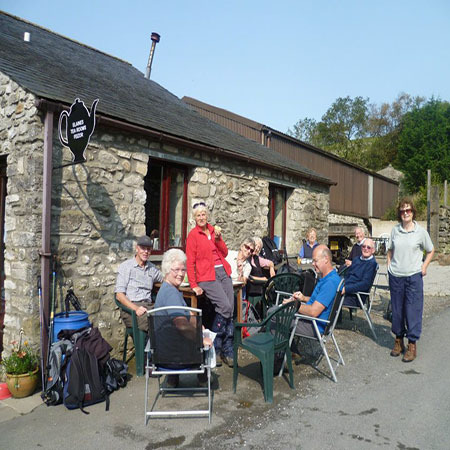 Run by Elaine Knowles, this farmhouse tea room, is situated in the heart of the dales, and is the perfect place for cyclists & walkers to take a break and sample delicious home cooked food, and refreshing beverages including speciality tea’s, coffee’s, and juices. Whether you travel by car, cycle or walk to Feizor on one of the many footpaths that meet there, Elaine's is a must to visit and is excellent value for money. Travelling towards Settle on the A65, where the road swings sharp right, take the narrow lane straight ahead, signed Feizor 3/4mile. At the small triangle go left along the road marked cul-de-sac, into Feizor. Home Barn is in the centre of the hamlet on the left. From Settle, cross the river into Giggleswick and climb up the quiet road, until at the top of the hill a narrow road signed Feizor goes off right. This leads to the triangle. Here turn right on the road marked cul-de-sac. Various sandwiches, toasties, panninis. Hot filled baguettes, burgers & baps. Jacket potatoes. Soup. Salads. Full English Breakfast (served until midday). Whitby Scampi. Sausage Egg & Chips. Tuna & Mozzarella Fishcakes. Potted Shrimps on Toast or Crumpets. Various daily specials including Chicken & Vegetable Pie, Meat & Potato Pie, Giant Yorkshire pudding with beef etc, Lasagne & Gammon (this is a huge plateful!!). Delicious roast dinners on Sunday. NB - the specials available vary from day to day. Fruit pies, fruit crumbles served with either cream, ice cream or custard. Lemon meringue pie, trifle, egg custard. Speciality ice creams. Various including coffee, lemon, chocolate & tray bakes. Scones. Teacakes. Tea (including speciality teas). Coffee - latte, cappuccino etc. Wide range of juices & soft drinks.